Murdokhai Izra will celebrate his 60th birthday next month at his home on Tunisia's south-eastern island of Djerba. A Tunisian Jew, Mr Izra only left the place of his birth when he turned 18 to enrol at the University of Gabes, still not too far away from his roots. "When I left Djerba to study commerce, I felt more and more homesick," said Mr Izra, as we met in Djerba's Ghriba synagogue as Tunisian Jews marked the annual pilgrimage to Africa's oldest Jewish temple. His son and two daughters did not follow in his footsteps. They received their university education in France, which they have since made their home. They are like thousands of other Tunisian Jews, whose number in the country nose-dived from 100,000 in 1960s to around 1,500 today. "They have never complained of discrimination, oppression or racism, as reported in the media. They just wanted to live in a European country - which is France - like many other Muslims and Christians," added Mr Izra. "All Jews in Djerba and those who left it are not rootless. Tunisia gives us all a sense of identity." Mr Izra, who describes himself as a "deeply religious Jew", has been performing the pilgrimage to the Ghriba synagogue for 24 years. For centuries, Djerba has been a focal point for Jews in Tunisia and the Arab world. "The temple has a soul of its own," said Mr Izra, as he lit a candle, a common Jewish ritual used to sanctify occasions. 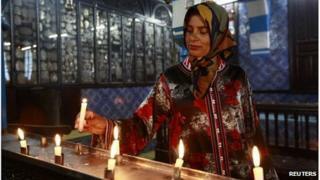 Tunisian Jews consider the synagogue the most sacred Jewish place of worship in Africa. According to tradition, the first synagogue on the site was built with a stone or gate brought from King Solomon's Temple in Jerusalem after it was destroyed in 586BC. The story of Tunisian Jewry however has been a troubled one with periods of oppression. In 1940, France fell to the Nazi forces and its former North African colonies of Tunisia, Algeria and Morocco came under Vichy rule. As in France, anti-Jewish legislation was passed in Tunisia, which included forcing all Jews to wear Star of David badges, as well as confiscating their property, and thousands were sent to forced labour camps. In 1942, Tunisia became the only Arab country to come under direct German occupation. The head of the Jewish community in Tunisia, Perez Trebelsi, however, questions the narrative of some Western historians that Jews were also persecuted under Tunisian President Habib Bourguiba, the founder of the republic after independence from France in 1956. "Bourguiba put all Tunisians on an equal footing, excluded nationalists, and annulled Sharia-compliant articles in the constitution like the ones related to polygamy and inheritance," Mr Trebelsi says. He insists that "socialist policies, especially in the key agricultural sector, forced many Jewish businessmen to emigrate to Europe for better economic landscapes". "Anti-Jewish sentiments ran high during the  Six-Day War," he recalls. "Some [Tunisian] Jews came under attack but from mobs. It was individual practices really, not systematic". Khodir Hanyna, a native Djerba businessman, wants to dispel stereotypical impressions of Tunisian Jewry. "The way Tunisian Jews are portrayed in the media is greatly exaggerated," he insists, in a mixture of dialectal Arabic and French spoken by all Tunisians. "I found most of the articles written on us were just sensational," adds Mr Hanyna, who spends most of his time of the year dividing his time between Tunisia and France. Waiting for his turn to be blessed by one of the synagogue's rabbis, Mr Hanyna says that although Tunisia is an overwhelmingly Muslim country, Jews never felt forced to leave their motherland. "Tunisia has been and is still an icon of ethnic diversity. Many of its Jews have just pursued better economic conditions abroad," he explains. Shirah Waheeb, a mother-of-three, is fed up with what she calls the "media fuss" about Jews in Tunisia and is irked by questions like "are you Tunisian Jew or Jewish Tunisian?" "The loyalty and identity questions in the media are just nasty," she says. Mrs Waheeb, who makes a living selling traditional necklaces, feels safe in the country and plays down the rise of Islamists in the wake of a popular revolution that toppled long-time President Zine al-Abidine Ben Ali in 2011. "Everybody has the right to free speech. No?" she asks, adding: "As long as it is not violent." Several media reports spoke about YouTube videos that showed radical Islamists threatening Tunisian Jews. Despite searching extensively, I did not find any of them. The only one I came across was of Tunisian Islamists vowing support to the late al-Qaeda leader, Osama Bin Laden. Security has been a big issue at the Ghriba synagogue since a militants linked to al-Qaeda attacked it with a truck bomb, killing 21 people. "The rise of Salafists [ultra-conservative Islamists] in today's Tunisia is a worrying sign - indeed to all Tunisians not just Jews," says Mrs Waheeb. The political unrest and almost absent security in the wake of the 2011 revolution forced authorities to suspend the pilgrimage to the Ghriba synagogue. It resumed the following year but only on a much smaller scale. Generally, the number of visitors from abroad has plummeted since the synagogue was attacked. In the past, it used to attract thousands of Tunisian and other Arab Jews mainly from Europe. Mrs Waheeb is critical of what she terms "religious profiling" in the Arab world. "I really hope to see the day when the Arabs consider us Jews as just Tunisians, no matter what religion we are," she says.